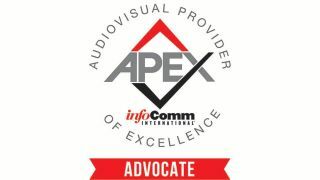 FSR has signed on as a founding member of InfoComm’s APEx Advocate Program, a new initiative from InfoComm International that is comprised of companies supporting systems integrators and dealers that have demonstrated their commitment to technical excellence and outstanding service by earning the organization’s AV Provider of Excellence (APEx) designation. The APEx designation is earned by meeting key markers of industry excellence that include: collaborating with clients to properly assess their needs; providing clear designs; making sure staff is trained and current in all industry and manufacturers certifications; ensuring installations perform to expectations; and offering world-class customer service. The APEx Advocate program gives manufacturers the opportunity to support APEx designated systems integrators through promotional consideration, outreach, and preferential services. Advocates have a vested interest in promoting designees in their marketing and training efforts because they benefit when their products are integrated correctly and adhere to the highest possible standards.